Historical romances are few and far between for me to pick up and read, but when I saw it featured dragon shifters, well I just had to give it a try. 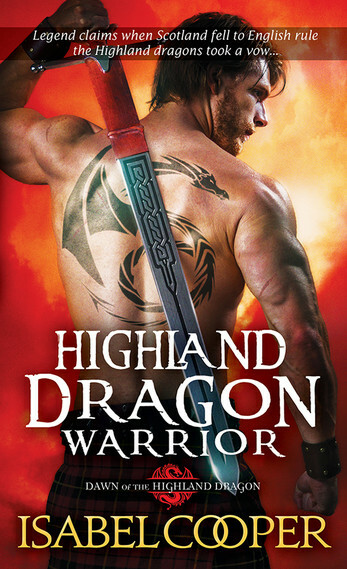 Highland Dragon Warrior was an interesting and pleasant read. It’s set in medieval times with magicians, sorcerers, dragon shifters, demons, and alchemy. It’s got mystery, action, and romance. Sophie our heroine is a strong and determined women. She’s smart and stands up for what she believes in. Cathal our hero is a powerful and fierce warrior. He’s fiercely protective of his family and those he cares for and looks after. I enjoyed the story. I loved the Scottish setting and the paranormal elements where fascinating. The author did a good job creating an intricate and appealing world, but man was the world-building extensive. I had a little trouble with the story; mainly their was just so much information with the world-building and historical aspects that the book felt slow. I also felt like I was back in school learning a lesson; especially when it came to Sophia’s alchemy and all the explanations that went into those scenes. Now for the dragons their weren’t that many scenes with the dragon shifters and their magic. I would have liked more. Their also wasn’t much action either, until the very end, when Sophie’s soul is endangered. As for the romance between Sophie and Cathal it was light and slow to bloom. I wish there was more interactions between these two to help build the romance. They spent a lot of time apart, watching each other across a room or briefly talking at dinner, but not doing much to move the romance along. Highland Dragon Warrior is not a simple read. The world-building is extensive and various discussions that take place where excessive and a bit overwhelming. It’s an interesting set up and I’m intrigued, but I was a bit bogged down and felt like I was back in school. *Disclaimer: I received a complimentary copy provided by Sourcebooks Casablanca via NetGalley with the sole purpose of an honest review. All thoughts, comments and ratings are my own. Scottish and dragons. Sounds like a winner. My first thought when I saw historical PNR was “geez I bet that took a lot of set up and building” then I saw your thoughts! I don’t like to give up on a series after the first book, just for that reason, that their is a lot that has to come across on that first one. I usually read up to 2 or 3; before stopping. I liked Highland Dragon Warrior it’s interesting, has a unique concept, but some of it made me think I was back in school. I appreciate you coming by and checking out my review. Great review Angela! Shared on all my socials!! Dragon shifters would have got my attention too. If it mentions dragons I’m all over checking out the book and putting on my TBR or reading it asap. They are a guilty pleasure of mine ^_^. When I saw it said dragons, I had to check out your review. I’m not a big historical reader though, mainly for the same reason you had a problem with the book. I find the world building really extensive and hard to get through. It also could fall into the ole book one of a series category. Ya I agree with you. I’m glad I gave this one a try. It was interesting and I did enjoy, but also did have some difficulties with it. I might pick up book two, but if I do I’ll grab from my library. We will see. Just so many books to try out and so little time. I completely get you. I’m not a big PNR reader but when we have dragons? ho can we resist? right?